File: Red Bull's Max Verstappen. 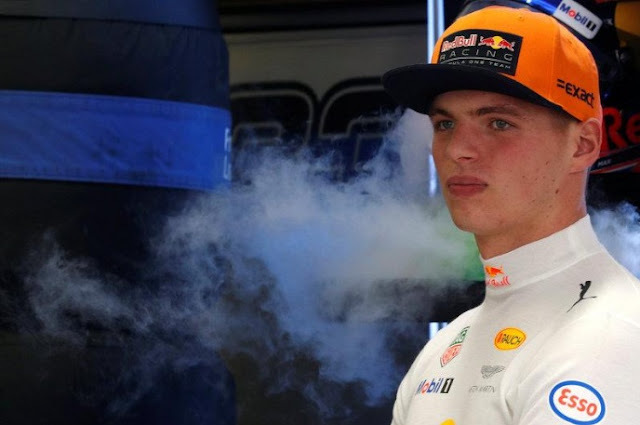 SINGAPORE - Dutch teenager Max Verstappen set the pace in final practice for the Singapore Grand Prix on Saturday as Red Bull continued to dominate ahead of qualifying at the Marina Bay street circuit. Verstappen lapped the 5 km Formula One track that winds its way through the heart of Singapore in one minute 41.829 seconds. That time was nearly a second slower than team mate Daniel Ricciardo’s effort on Friday. Sebastian Vettel, inconspicuous on Friday, set the second quickest time in his Ferrari, just 0.072 off Verstappen’s best. Championship leader Lewis Hamilton was third for Mercedes, 0.142 seconds off the pace. Red Bull consider the Singapore race as one of their best venues to secure a second victory of the season following Ricciardo’s success in Baku in June. But the former champions suffered a scare late in the session, with Verstappen reporting his car was shifting gears on its own. The tight twists of the 23-turn track are also expected to play to Ferrari’s strengths. Mercedes and Hamilton, however, are expecting more of a challenging weekend. The Briton goes into the race three points ahead of Vettel in the overall standings with seven of 20 races still to run and is seeking a third successive win on Sunday. Fernando Alonso set the fourth-fastest time ahead of McLaren team mate Stoffel Vandoorne just a day after the Woking-based squad announced a split with engine-supplier Honda and a new deal starting next year with Renault. Ricciardo was sixth after he hit the wall on his flying lap. Renault’s Nico Hulkenberg was seventh. Valtteri Bottas, whose future at Mercedes alongside Hamilton was confirmed earlier in the week, struggled in eighth. His compatriot Kimi Raikkonen was also far off the pace in ninth for Ferrari, ahead of Force India pair Sergio Perez and Esteban Ocon. The session was briefly red-flagged after Marcus Ericsson lost control of his Sauber and crashed into the barriers. The Swede lost his rear wing but was able to drive his car back to the pits. Verstappen’s practice pace puts him on course to become the youngest driver ever to take pole position in qualifying later on Saturday. It would also be the 19-year-old’s last chance to achieve the feat as a teenager, with the Dutchman celebrating his 20th birthday on Sept 30, when qualifying for the Malaysian Grand Prix will take place. Dutch teenager Max Verstappen set the pace in final practice for the Singapore Grand Prix on Saturday as Red Bull continued to dominate ahead of qualifying at the Marina Bay street circuit.